Transmilenio buses ready to meet peak traffic demand, Bogotá, Colombia. Photo by Gerardo Arévalo Tamayo. A message from Manish Bapna of the World Resources Institute. Originally posted on WRI.org. When it comes to changing the way we use energy, cities are at the center of the action. On June 2nd, I had the pleasure of speaking at the C40 Summit in São Paulo, Brazil. The C40 Cities Climate Leadership Group consists of iconic cities from around the world committed to addressing climate change. Chaired by New York City Mayor Michael Bloomberg, the group has recently joined forces with the Clinton Climate Initiative’s Cities Program. Together, this partnership can have meaningful role in the fight against climate change. Cities are already responsible for more than 80% of the world’s greenhouse gas emissions. By 2030, the world will have almost 5 billion city residents – about 60 percent of the world’s population. These cities will need to learn quickly how to build housing and transportation systems, ensure food and energy supplies and deal with waste – all while cutting back greenhouse gas emissions. Cities are part of the problem, but they are also part of the solution. They are centers of innovation and incubators for new technologies. This was apparent at the C40, where representatives from cities as diverse as Lagos, Jakarta, and New York were sharing stories of what works and what doesn’t. My job at the C40 was to participate in a roundtable discussion on some of the ways cities can address their energy consumption. This is a real challenge as energy accounts for almost 65% of global greenhouse gas emissions. We can’t successfully tackle climate change without redefining how we produce and consume energy. This is absolutely true. Cities must know what their greenhouse gas emissions are before they can set targets and develop policies to reduce them. Mayor Bloomberg’s tweet was a reference to a key initiative announced at the meeting: the C40’s collaboration with ICLEI – Local Governments for Sustainability to develop a standard for measuring city greenhouse gas emissions. ICLEI’s new effort is building upon years of accounting experience, including WRI’s Greenhouse Gas Protocol—now the leading international accounting tool for businesses and governments to measure greenhouse gas emissions. WRI has begun developing a city-level emissions accounting framework tailored for China. WRI’s city framework will measure both direct and indirect emissions. This means that emissions from goods and services produced and consumed by city residents would be included in a city’s emissions assessment. Our goal is for WRI’s city accounting framework to complement and align seamlessly with ICLEI’s standard, so that cities all around the world are able to accurately measure – and thereby manage – their greenhouse gas emissions. Another exciting possibility for cities lies in Bus Rapid Transit (BRT). BRT systems comprise dedicated bus lanes, large buses with multiple doors to make boarding and exiting faster, and stations where you can buy your ticket before you get on the bus. 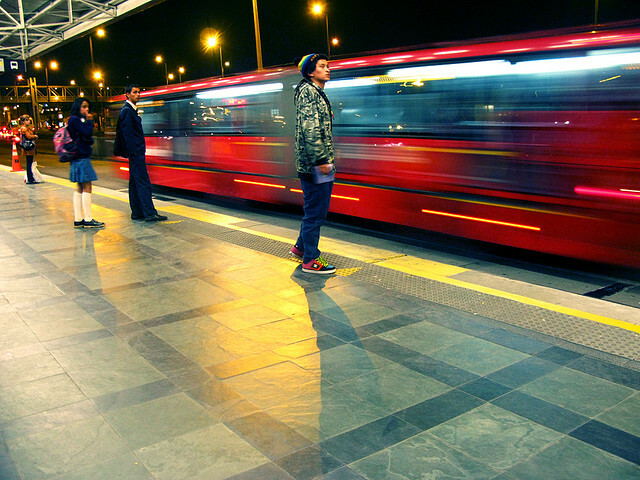 These systems provide transportation to more people, more efficiently than ordinary bus lines. They encourage people to uses buses instead of cars or motorcycles. They are much more efficient than regular bus lines and therefore use less fuel. They can even encourage smarter, denser urban planning and thereby reduce the number and length of motorized trips required for urban life. BRT installation is accelerating at a tremendous pace. Around 120 cities now have BRT systems or bus corridors, and the vast majority of them were constructed in the last 10 years. Quite interestingly, most cities embracing BRTs are in the developing world, where they have proven a less costly alternative to light rail. Cities are prime locations for what is called “distributed on-site solar”, meaning solar power that is generated at small scale (like on individual rooftops) and often used at or near the same site where it is generated. The problem now is that each building owner needs to install his or her own panels, and learning about the different financing options, technologies and permitting processes can be overwhelming. At WRI we are analyzing the possibilities of collaborative solar purchasing, which allows small homeowners or businesses in the same area to collectively negotiate solar power contracts. Bringing buyers together, educating them about the technology, and clarifying financing options can lower costs by 10-15% and save 75% on administrative time and fees. In Portland, Oregon residential solar PV installations have tripled since the city began facilitating collaborative purchases. San Francisco, in collaboration with WRI and others, is designing a new collaborative purchase program for businesses. Negotiations are underway with vendors now, and the first round of projects is likely to result in more than 2 MW of distributed solar installation. Is this model applicable in other countries? We will soon see. China is currently designing its own Solar China Cities program – similar to the Solar America Cities program mentioned above – that will target 100 cities. And India has announced plans to support 60 solar cities before 2013. At times here in Washington, optimism about our capacity to solve the climate crisis is in short supply. But our cities give us reason for hope. Though they can’t do it alone, these hubs of innovation are leading the way. By showing that fighting climate change goes hand in hand with creating jobs, increasing security, and improving the quality of life for our growing urban populations, these incubators may help to break down some of the inertia that persists in other political arenas.